On Friday December 2 I posted Steve Clapp’s Fixing the Food System in my series on Weekend Reading. His daughter has just written to tell me that Steve died on December 1 of acute leukemia, which he learned he had just six weeks earlier. I so hope that he was able to see his book, hold it in his hands, and celebrate its arrival. Memorial service: January 28 at Wakefield Country Day School, Flint Hill, VA, 2:00 p.m. with reception following. Doors open at 1:00. In sadness, I am repeating the post in honor of his memory. Steve Clapp. Fixing the Food System: Changing How We Produce and Consume Food. Praeger/ABC-Clio, 2017 (but published November 30). In this welcome addition to my library of books about food policy and politics, Steve Clapp’s Fixing the Food System reviews the past and current history of calls for a national food policy, the most contentious controversies over food and nutrition issues that have impeded development of such a policy, and the work of advocates to achieve one. As this book makes clear, this history began decades ago. I first became aware of the importance of federal food policies in the early 1980s when I was teaching nutrition to medical students at the University of California San Francisco (UCSF). First-year students were eager to learn about nutrition, but for personal more than for professional reasons. They wanted to know what they—and the patients whose health problems they were learning to treat—should eat. But by the time they were residents, I could see their dietary concerns vanish under the daily demands of patient care. Trying to advise about diets was too difficult, time-consuming, and financially unrewarding to be worth the trouble. It seemed unreasonable to expect doctors to take the time needed to counsel individual patients about the prevention of diet-related conditions—heart disease, type 2 diabetes, cancer, and the like. If nutritionists like me wanted to focus on disease prevention rather than treatment, we would have to advocate to change the food environment to make healthful food choices the easy choices—even better, the preferred choices. This meant we would have to advocate for food and nutrition policies aimed at promoting public health. The U.S. government helps to assure an adequate food supply for Americans by sponsoring a wide variety of food, nutrition, and agricultural support programs. These federal activities were developed in the absence of a clearly articulated national policy, a situation that has resulted in the fragmentation of government programs and their wide disbursement among numerous agencies and departments. Assure an adequate, wholesome food supply, at reasonable cost, to meet the needs of all segments of the population. Maintain food resources sufficient to meet emergency needs and to fulfill a responsible role as a nation in meeting world food needs. Develop a level of sound public knowledge and responsible understanding of nutrition and foods that will promote maximal nutritional health. Maintain a system of quality and safety control that justifies public confidence in its food supply. Support research and education in foods and nutrition with adequate resources and reasoned priorities to solve important current problems and to permit exploratory basic research. Whether offered as nutrition or food policies, these were and remain highly appropriate goals for an abundant, healthy, safe, and effective food system. The effect on the nation’s health of food processing and other changes in the U.S. diet is controversial. Salt, sugar, fiber, saturated fats, alcohol, caffeine, calories, vitamins, and food additives all elicit vigorous debate. Today, more than 30 years later, we are still arguing about that science, and the scientific arguments still impede policy development. In Fixing the Food System, Steve Clapp brings us up to the minute on federal progress (or the lack thereof) toward achieving a clearly articulated national food policy. 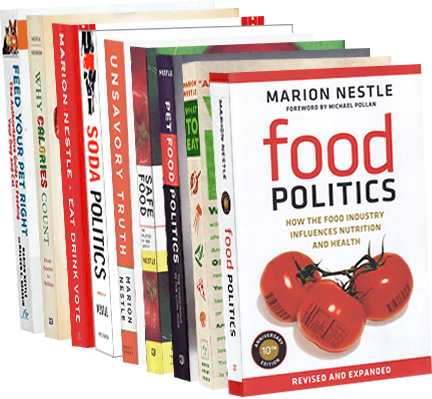 He begins and ends his book with the most recent policy proposals from leading food advocates Michael Pollan, of course, but also Mark Bittman, Olivier de Schutter, and Ricardo Salvador. Their recent suggestions for improving our current food system reflect the many changes in agricultural production and food consumption that have taken place since 1974 but retain the basic elements of those earlier proposals. Fixing the Food System explains why a national food policy is so badly needed and matters so much. Steve Clapp is in a unique position to comment on food policy issues. He’s been at the policy game for a long time. I don’t remember when I first met him but I have been reading his work since he reported for the Community Nutrition Institute’s newsletter, Nutrition Week. For those of us outside the Beltway in those pre-Internet days, Nutrition Week was a lifeline to the ins and outs of food politics in Washington, DC. Later, when Steve moved to Food Chemical News, also—and still—a lifeline, I continued to read his reporting. I often ran across him at meetings and hearings in Washington, DC and found it instructive to read what he wrote about those deliberations, not least because he got it right. I say all this because he has been a keen observer of the food politics scene in Washington for decades and I can’t think of anyone who ought to know it better. Fixing the Food System reviews the major debates he witnessed—the Dietary Guidelines, of course, but also attempts to set policy for food safety, marketing to children, hunger in America, and humane treatment of farm animals, among others. Over the years, he also observed the work of policy advocates, and this book includes profiles of many individuals engaged in this work, some likely to be familiar to readers, whereas others may not. Impossible as it is for me to judge whatever impact my own writing and advocacy might have, I am honored to be included among those whose work he presents. Fixing the Food System describes political arguments over the kind of food system we ought to have and what an ideal system should accomplish. But it is also about the importance of personal and political advocacy for a better food policies, those aimed squarely at promoting public health and environmental sustainability. Advocacy makes a difference. Advocates are scoring successes in improving one after another aspect of the food system. In comparison to the 1970s or 1980s, we now have better food in supermarkets, more organic foods, more farmers’ markets, more nutritious food in schools, and impressive declines in consumption of sugary drinks. My personal favorite among indicators of advocacy success—the change that makes me most optimistic—is the increasing number of college students who care deeply about food issues. They are demanding local, seasonal, organic, and sustainably produced food in their cafeterias, and campus vegetable gardens. And they are demanding and getting food studies courses and programs like the ones we started at New York University in 1996 that teach about how food is produced and consumed and the practical and symbolic meanings of food in modern culture and societies. Today’s students are tomorrow’s advocates for healthier and more sustainable diets for everyone, everywhere, and for fixing what needs fixing in our food systems. This book is a great starting place for this work. [i] Nestle M, Lee PR, Baron RB. Nutrition policy update. In: Weininger J, Briggs GM, eds. Nutrition Update, Vol. 1. New York: John Wiley and Sons, 1983:285-313. [ii] National Nutrition Consortium, Inc. Guidelines for a national nutrition policy. Nutrition Reviews 1974;32(5):1253-157. The Consortium included the American Institute of Nutrition, the American Society for Clinical Nutrition, the American Dietetic Association, and the Institute of Food Technology. [iii] Pollan M. In Defense of Food: An Eater’s Manifesto. Food Rules: An Eater’s Manual. Penguin Press, 2008.